Yeah, my sewing has gotten off to a rather slow start this year! Between the reorganization project taking longer than expected, and the continuing saga of naptime issues (spoiler alert, he still doesn’t want me to put him down, even with that zippy swaddle thing from the last post), I was getting really concerned that I wouldn’t finish what should have been a simple project in time to tie it in with this month’s theme at The Monthly Stitch. I don’t manage to play along every month, but I was really excited about my idea for a garment inspired by a favorite beverage! Only, it didn’t quite go as planned. I’m a little embarrassed to share this one, honestly. But not every project is going to be a winner, and I think it’s important to learn from the fails, too. Obviously, my beverage of choice had to be tea. But I already have a dress with teacups on it, so my idea was to start working on this year’s goal of replenishing my pajamas/loungewear wardrobe, with the help of some tea dyeing. 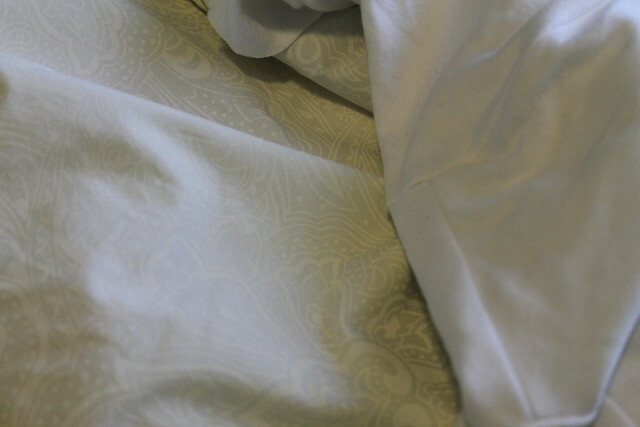 I had a piece of what I’m fairly certain was a bedsheet, which got passed on to me when someone destashed it onto my mom. I knew the effect of the dye would be subtle, since there was most likely some polyester content in the fabric, but I hoped that it would be just enough to bring out the tone-on-tone print. 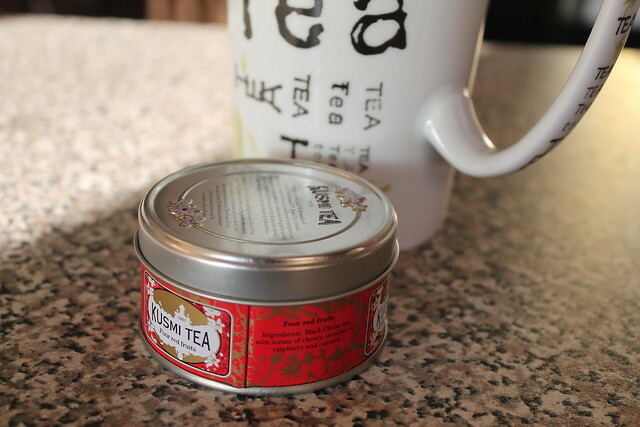 So I got my tea brewed–not a brand I actually care to drink, of course– boiled the fabric in it for as long as we could manage to keep Hobbit happy, washed it…and ended up with exactly what I’d started with. Drat. I decided to go ahead and start sewing anyway. The pants are the Sewaholic Tofino pattern, which I’ve made before, and will likely make several more times this year, because I like the way they fit me. I didn’t even have to make any sizing changes to accommodate the extra post-baby pounds! I made the piping and ties out of a remnant of solid brown left over from an old dress, thinking the brown might help tie in the tea idea. 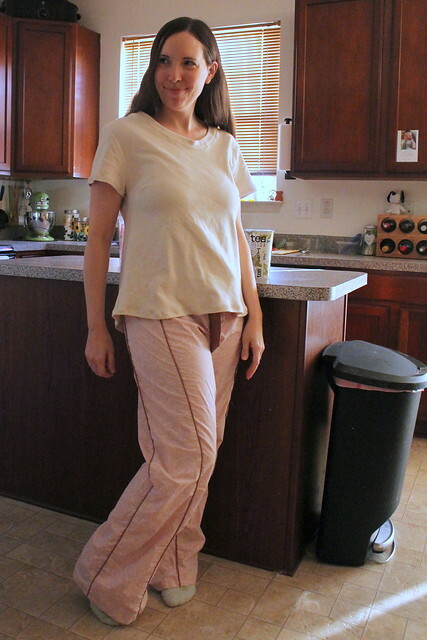 I realized closer to the end of the sewing process that I still didn’t feel comfortable with the color, and especially the thought of taking blog photos in white, somewhat see-through pants. So I broke out more dye, this time in chocolate brown. Surely that would tint the cotton to a nice, tea-stained tan, right? Nope. It turned pink. Pastel pink, of all things. Which is my third least favorite color on the planet, when not occurring naturally outside. I’ve actually had this problem before with this color, but in the context of dyeing silk. I sure didn’t think a poly/cotton blend would act the same way! So, what to do? 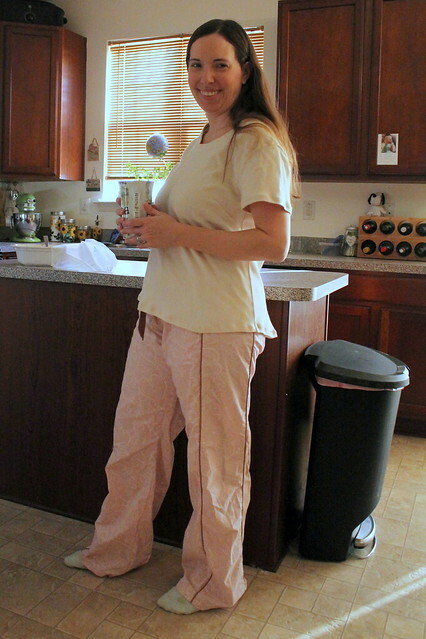 Though the half-finished tee from my refashion bin took the tea dye in a subtle way, the pants just didn’t read “tea” to me. And I will take a chocolate milkshake over strawberry every single time, so that wouldn’t make a good inspiration drink for me. Then I remembered that I had this “four red fruits” tea that I brought home from Paris, which is still around thanks to the cruel pregnancy trick of mostly not being able to stomach tea. It’s a black tea with strawberry, raspberry, Problem solved! A quick note on the shirt: I don’t really know what pattern it is. It’s one of two identical white tees that my mom started and didn’t finish, because she doesn’t particularly enjoy making clothes anyway and she wasn’t happy about how it was turning out. 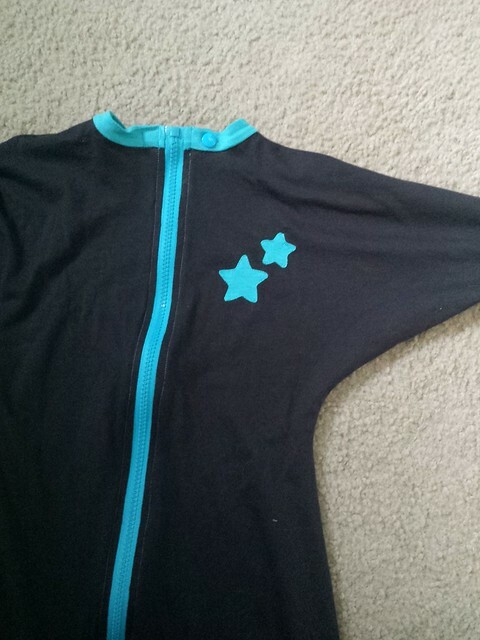 My original thought was to maybe recut it into a Plantain tee or something, but then I noticed that the side seams had been sewn already, and I was getting anxious to finish it up. So I just zig-zagged the neck binding and hems down as it was, though I did serge the sides and sleeves in a little because I was hoping to cancel out the dropped shoulder a bit. I’d also thought of maybe stenciling a teacup or something on it, because it’s admittedly boring. And maybe someday, I’ll do that. As you can imagine, I’ve gotten a myriad of advice from well-meaning people. I won’t get into that here. The relevant tidbit is that one of my best friends, who is on her second child (3 days younger than my own, they were meant to be friends! ), suggested that I try this swaddle blanket thing. It’s basically supposed to be this miracle thing that instantly improves the baby’s sleep. I thought about it, I really did. But given how many different things I’ve tried so far, I just couldn’t bring myself to pay almost $40 for something that might not work. Especially since it looked like it really wouldn’t be that difficult to come up with something similar. 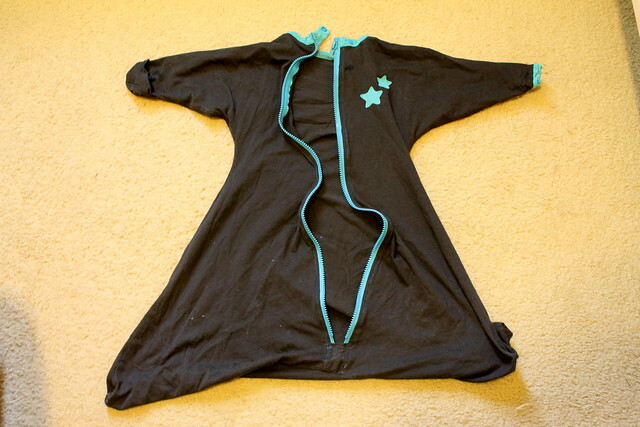 After asking around on a boy sewing-specific group on Facebook, someone pointed me to the Star Sleeper from Koerbs Bros. So this is my version. I modified it a little, mostly to straighten out the lines between the feet to make it more of a sleep sack. But I also added a tab to go behind the zipper stop, because I was afraid it would scratch up his neck– the separating zipper was pretty stiff and plasticy at the ends. I had to buy the grey fabric, because I literally didn’t have enough yardage of any knit that wasn’t straight-up polyester. And Hobbit gets hot easily, so natural fibers and breathability was a must. The blue bits are scraps from this top, which has been languishing in my recycle bin ever since it started developing holes almost right away. And here it is on him. The verdict? Well…. I’m not sure yet. 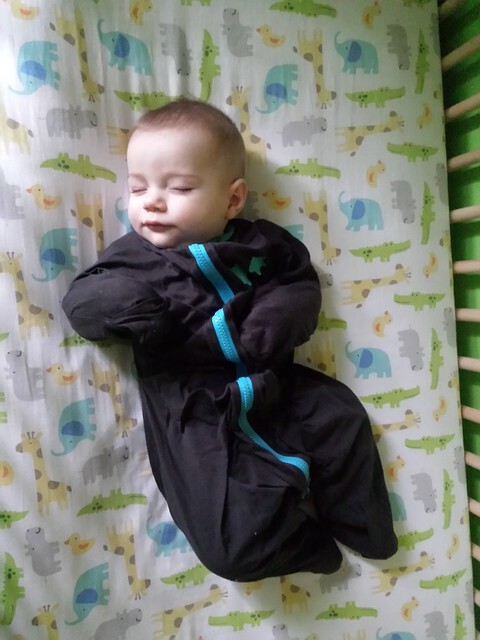 The first time I tried it on him, his first stretch of sleep was longer than it had been. But then he was still waking up every 1-2 hours after that. I have gotten him to nap in it, but only for about 45 minutes, tops. And lately, it’s all been out the window, as we’re in teething hell and he will literally only sleep for longer than 45-60 minutes if one of us is holding him. So maybe once these two teeth pop out, I can really try again and see if this thing actually works? As it is, I’m really glad that I did this $18ish version instead. Oh, yeah… I actually finished this on December 31st, so this is the real last project of 2015. Hopefully it won’t be too much longer before I actually can start on a project this year! I’ve spent most of the time lately getting my fabric stash reorganized and updating my spreadsheet, and it looks much better now. Not to mention much more accessible, since I made sure to put all of the fabrics that I know what to make them into out where I can easily get to them, and paired with the relevant patterns when at all possible. I counted up at the end, and I easily have my next 50 projects here, so I’d better get some sewing time soon! I’ve been working pretty hard over the last week or so to get all of my more recent fabric acquisitions washed, folded, and tallied up. I like to start the new year with a clean slate, and see where things really stand. It also ties in with the current theme in the Stashbusting Sewalong, which is stash organization. And, well…my one Stashbusting Sewalong goal for 2015 was to end with less fabric than I started with. In this, I failed. Epically so. To be fair to myself, I did have two destashings land on me, from my in-laws and from a friend of my grandmother’s. I was certainly not planning on that. And as I was going through things, I did find about 19 yards’ worth of older fabrics that I just hadn’t added in, or leftovers that I didn’t think were big enough to be worth measuring. So my numbers at the beginning of the year weren’t entirely accurate. But I did buy a few pieces near the end of the year that were specifically to test a few newer patterns, after checking my stash and seeing that I didn’t have anything appropriate. (Or, in the case of the Ginger jeans pattern that I finally just bought, I didn’t want to sacrifice the stashed stretch denim until I’d tested it. Because I bought that denim in Paris, and I may never be able to fabric shop there again.) And I got a lot of fabric for Christmas this year. As in, nearly 30 yards of it! Oh, you want to see the pretties? Twist my arm, why don’t you? These 6 pieces are actually more for Hobbit, but I get the fun of sewing them up! The ones on the right are for another batch of diapers. I’d mentioned before that I made newborn, small and medium sizes. And I knew there was the possibility that I’d have to do the large size as well. Well, at 6 months old and well over double his birth weight, he’s pretty much at the largest setting that the small diapers will go at. I really doubt that he’ll stay in the mediums long enough to get to a good potty training age. So to be on the safe side, I’m going to make a batch of larges. The two fabrics on the left are knits, so I can finally try out some of the cute stuff in the two Ottobre magazines that I picked up over last year. Between the Teenage Mutant Ninja Turtles and the hockey sticks in the Canada print, my mom was definitely working to keep my husband happy! And then there’s these 10 (!) pieces for me. There’s a plaid flannel with an Archer shirt in mind, and two more flannels for some much-needed pajama pants. There’s several knits, which is great, because my stash of print knits was almost non-existent by this point. And you all know how I love my prints. There’s a couple of pieces of denim, and a Cotton & Steel voile that I just want to wrap around myself like a blanket. It’s like a silky hug. Stash at the beginning of 2015: I’d originally said 375. My adjusted number is 394. Stash at the end of 2015: Just over 426. Yards used up: about 91.5. Considering everything that was going on in my life last year, I think that’s pretty good! The difference: A net addition of 34 yards. Honestly, I probably shouldn’t be too hard on myself, because that means that even with the Christmas haul, I would have done really well if it hadn’t been for those two destashings! I think my focus/goal for 2016 is to really buckle down on using what I have on hand. So with that in mind, I’m going to see just how long I can go without buying any new fabric or patterns. I bought a few more at the end of December that will hopefully fill some gaps on staples (namely, the Ginger jeans, which I’ve been wanting to try since before the pregnancy). I will make exceptions on things like zippers and buttons, if I don’t have those things on hand, especially since button-downs are a major goal of mine this year. And I’ll make an exception for Halloween, because I’m very excited about my plan for this year, and I have almost literally nothing on hand that will work. But I’m hoping that if I really buckle down and get creative with the patterns and fabric that I have, I can make a serious dent in this ridiculous pile this year. You know, assuming that I can get the baby to learn to take naps or something.